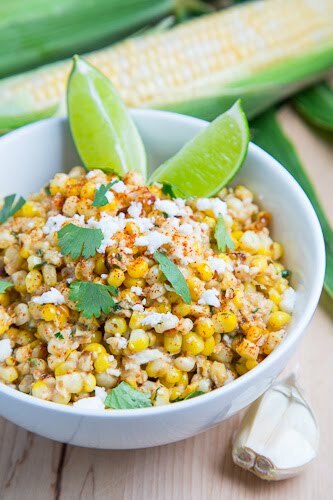 A tasty Mexican street corn salad with an amazing blend of sweet corn, salty cheese, sour lime juice and a hint of spicy chili powder; pure summer in a bowl. If you like Mexican corn on the cob, elote , then you are going to love esquites which is essentially elote but served in a bowl, only better! This year I have been enjoying using my cast iron skillet to ‘roast’ corn until the kernels char and caramelize which intensifies their sweetness making them even more irresistible! When I came across the idea of esquites where the corn is roasted in this way I immediately knew that it would be amazing! This salad has it all with the sweet caramelized corn, the salty cheese, the sour lime juice and the jalapeno heat and it is all held together with garlicky mayonnaise! 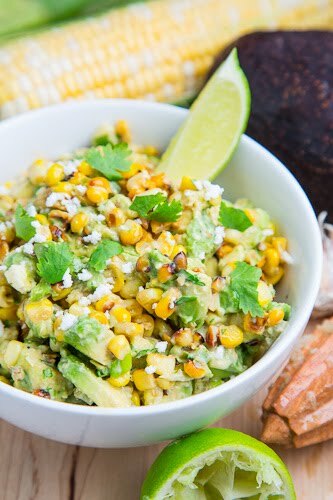 Update: If you like esquites, then you will love it with the addition of creamy avocado! Add the corn, toss and let it sit cooking until charred, mix it up and let it char again, about 6-10 minutes. Add the jalapeno, saute for a minute and remove from heat. Option: Adding one diced avocado is so amazing! Love the sound of this Kevin! I am always using my cast iron skillet and roasting corn in it sounds like a fabulous idea. This looks so Yummy thanks. I love mexican corn on the cob, so this corn salad sounds great! This sounds delicious and will bring sunshine to my plate since it is so elusive in Scottish skies of late. Just to check,green onions are what we would call spring onions in the UK? Karen Dodds: Yes green onions are the same as spring onions. As much as I hate mayo most of the time, I love it on elote. This corn salad sounds so delicious! This sounds amazing. I just bought corn last night… I might switch it up and make this instead of leavin it on the COB! Would it lose too much without the jalapeno? I can do the chili powder but I don't do heat well overall so don't eat them. I love corn though so this looks great. Thanks for such a great recipe, Kevin! As soon as I saw it, I knew I had to make it…so glad that I did, it was amazing! We loved it…I added some red bell pepper along with the jalapeno, also added avocado at the end, as avocado makes everything better =) Thanks again! I saute the cut-off kernels in a bit of corn oil till beginning to brown a bit, then add lime juice, cayenne powder, and sour cream near end to warm through. Finish with a bit of crumbled cotija cheese (I keep it in the freezer). Just cannot get enough of that flavor combination! I've heard esquites can be eaten cold but mine never makes it long enough to find out. I love fresh summer corn and your recipe sounds so fresh and delicious! I could spend hours on your blog. Another fantastic recipe. Have a terrific week! Hiya fellow Torontonian! Jalapeno and cilantro together are match made in heaaven – thanks for the recipe! I make something similar, but yours sounds way better! I just make corn on the cob (boiled)and cut off the kernels. Then I mix in mayo, chili powder, a dash of hot salt, mozerella cheese (or whatever is on hand)and heat it for a bit in the microwave to melt the cheese & bring the flavors together. I finish it with a squirt or two of lime juice and it is SO good. Ultimate comfort food! Beth: Glad you enjoyed it! I was already thinking that avocados would be great in it and red peppers would also be good! Sweet corn, cheese, lime juice, chili powder AND cilantro. Definitely a winner, Kevin! This picture alone is making my mouth water! Sweet corn is at its prime right now in Indiana, and I for one am trying to make use for it wherever I can. This goes to the top of the list! I am definitely going to try that it seems delicious and right now in SC we do have a lot of corn. I used frozen corn instead of fresh and sliced avocados over the top, my co-workers raved over it! I always love your recipes and how easy they are to replicate. Thanks again for helping me keep the hungry hordes happy, Steph. we've had such a humid heatwave that sadly I haven't been baking at all. I think you made a corn relish once didn't you? I made this tonight and I really enjoyed it! My only suggestion would be to measure the corn by the cup, and not by the ear. I used 5 years, but they were kind of small, and I felt like there was a little too much lime and not quite enough corn. I love your recipes though! Keep them coming! Kevin, your recipe isn't clear to me whether I should roast the corn – on the cob – in the skillet, or take the kernels off first? I plan to make this salad for a potluck tomorrow night! Oops, sorry, I didn't see that you take the corn off the cob! Could I substitute Mexican crema for the mayo? Brittany: Mexican crema would work as a substitute for the mayo. This looks absolutely amazing!!! Trader Joes sells an already roasted frozen corn that tastes REALLY good… This looks like something I could make year round if I used the frozen. I will try it with fresh though while it's still in season. I had high hopes for this, recipe, but if you follow it as the directions state, you wind up with wilty cilanto and green onion and melted, not crumbled cheese. Also, the avocado is not listed in the ingredients. What I will do next time: cook the corn and wait to completely cool, or put in the fridge. Then I would add the cilantro, green onion, greek yogurt (better summer flavor and less heavy than mayo) and crumbled cheese when it is all cooled off so the flavors blend, not slop together in a gooey mess. B. Anderson: Yes, cilantro does wilt when you place it in any warm dish which is why it is generally added at the end after being removed from the heat which minimized the amount of wilting. I have never seen green onions wilt before… That partially melted cheese is one of the best parts of this salad! This salad would also be good cold or at room temperature! How far ahead in advance could you prepare this? Does the corn get soggy? Leah Joy: This corn salad is good both fresh and warm and cool from the fridge where it will last a day or more. This salad is delicious. I made it the night before and then let it come to room temp. before serving. Everyone loved it. And, leftovers were great the following day. As a Mexican, if I didn't have cotija, I would use parmesan. Feta has a bit more acidity than I'm used to but its a good! Thank you SO much for this recipe! I served it cold, like a pasta salad and it was delicious. (I ate some warm when I first finished it and it was superb as well) I used frozen, organic corn from Costco. I let it thaw on the counter for a good hour and then charred it. It took a bit of patience but the end result was quite nice! I too added red bell pepper. I went heavy on the cilantro as I feel I can never have too much of that. Some of my guests at it like a salsa on a tortilla chip. Yum! Leah Joy: I am glad that you liked it! Eating it with corn tortilla chips is always fun! I made this for a party last night, along with a salad with your Jalapeno Buttermilk Dressing. Both recipes came out so well and garnered many compliments — I will definitely continue to make your recipes. I made this dish on Saturday for a potluck on Sunday. It was delicious and I cannot wait to make it again! I didn't have feta, so used Parmesan, which was fine, but I will use feta the next time. I just let it get to room temp before serving. Several people asked for the recipe! Is that a bit of avocado I see in the photo? I don't see it listed in your writeup. Doug: Yes the second photo shows the version where I add a diced avocado. It goes so well in esquites! If Jalapeños are too hot, you can Tame the Heat by removing all the seeds and deveining them. The soak them in milk for about 5 minutes. You have the Flavor without the Heat!! Kevin, I've made this twice now with a fresh corn called Amaizing from the local produce stand. The Esquites was Amaizingly good! It is hands down my new favorite non-lettuce/greens side dish or salad. It's fantastic! This was amaaaaazing! I've been snacking on the leftovers all week! I found that it took almost twice as long for me to char the corn on the stove – I like mine pretty dark – but it wasn't a big deal. I bet this would also be great with grilled corn. Yum! The Petite Gourmet: I'm glad you enjoyed it! Grilled corn would also be great! I make this at least once a month… It is one of my favorite snacks when eaten with tortilla chips and it makes a great addition to quesadillas and tacos! Thanks for the recipe! I can't remember if I've left a comment on this recipe yet, but if not, thank you so much for this recipe! It has quickly become a favourite of our family. Anytime we are asked to bring a side anywhere this is what I bring and it always gets rave reviews from anyone that tries it. Tara: I'm glad you like it! Making this a second time because it was so good. A great way to showcase the corn of the season. I only added more jalapeno as I like it hot. Thanks for another great recipe, Kevin!